Andre Villas-Boas’ odds on becoming Celtic’s next permanent manager have tumbled, with the Portuguese boss now at 6/1 third favourite behind Neil Lennon and Roberto Martinez. The 41-year-old, who has been out of work since a spell with Shanghai SIPG, reportedly played golf with the Hoops’ major shareholder Dermot Desmond recently. Rangers defender Joe Worrall is likely to escape disciplinary action from the SFA after a video emerged of the on-loan Nottingham Forest man having a foul-mouthed pop at rivals Celtic after the Light Blues’ awards bash on Sunday night. Worrall was filmed saying “F*** Celtic” on social media in the aftermath of the event. Footage showed the 22-year-old in the back of the car with a female friend who says “No surrender” before he weighs in with his two-word comment. Hertha Berlin were keen on Belgian international Dedryck Boyata last summer, as the Bundesliga side close in on a Bosman deal for the out-of-contract Celtic ace. The 27-year-old will bank £2 million a year by joining the German capital outfit, through a sizeable signing-on fee and a weekly wage of around £40,000 - making him one of the Old Lady’s highest-paid players. 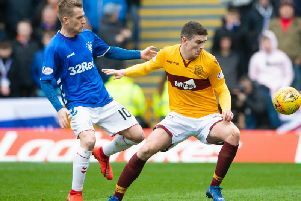 Polish outfit Lech Poznan are keeping an eye on Motherwell midfielder Alex Rodriguez, with the Spaniard out of contract in the summer. The Steelmen are keen to hold onto the 25-year-old but the former Sunderland kid is attracting interest thanks to his performances protecting the ‘Well back four. Tony Watt will leave St Johnstone in the summer after turning down a new deal at McDiarmid Park. The former Celtic striker has scored seven goals in 37 outings for Tommy Wright’s side but will be moving on come the end of the season.